Thirty days ago I had a goal. A goal to write one blog post every… single… frickin’… day. Now, as I stand upon the threshold of immortality, a shell of the writer I used to be, I can look back upon the posts and say… I wrote that? At least there is documented proof of when I got my best job to date. I also promised to take on an unwanted partner named Fred that has taken over my mid-section. I questioned parents who take their toddlers to coffee shops at 10:00 p.m. (and learned never, ever, even hint that you are questioning some random person’s parenting skills because, oh, you might strike a nerve). I documented my daughter’s leaping ability and also that I am, indeed, her best friend, and I am reminded of a favorite memory. November wasn’t that bad. A lot of good things happened. And because I wrote of them I’ll never forget them. Of course, December is a whole other matter. This morning I had an important meeting. As far as meetings go, this one was a big one. It was a suit and tie meeting with very important people. I needed to make a good impression and I needed to be on time. Unfortunately, TheMonk decided today was the day that he was going to be grouchy. The entire morning from the moment he got up he was in a funk. If you told him his red cup was red, he’d tell you it was blue. If he told you he was done with breakfast, after you cleared his tray, he’d scream that he wasn’t finished. If you gave him one cracker, he demanded four. I was wearing a crisp white shirt, tie and a charcoal suit and it is very difficult to wrestle with screaming, kicking two-year-old while trying to maintain a GQ look. But I managed. After getting shoes on and struggling to get him into his car seat, all the while he was screaming for “MORE CRACKERS!”, I was able to put Swee’Pea into her car seat (who, by the way, made a point of reminding me that “I’m not crying, Daddy”) and head off to daycare. 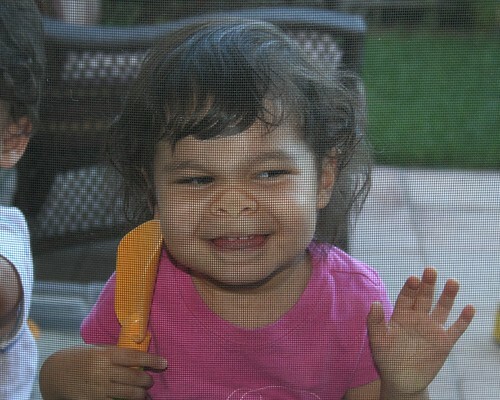 We pull up to the daycare provider’s house and I get Swee’Pea out of the car first. I go around to the other side and attempt to remove TheMonk. He’s still doing his best Tasmanian Devil imitation but I manage to pull him free from his chair and set him down on the grass beside the car. At this point another parent has arrived to drop off his extremely well-behaved kids and they all watch as I leave TheMonk flailing away and screaming on the front lawn of the daycare provider as I carry Swee’Pea to the front door as she has developed a recent phobia of cars in the street and thinks that all cars are somehow going to jump the curve and mow her down in the prime of her life. As the daycare provider opens the door, we all turn our attention to TheMonk who is now on all fours and braying like a rented mule. I usher Swee’Pea into the door and I return to TheMonk and pick him up with my hands under his armpits. I have to extend my arms out while holding him away from my body to avoid his kicking feet. I rush him to the front door and I thrust a screaming, kicking, two-year-old to our unflappable daycare provider, mentioned I had an important meeting to get to and rushed off. 30 minutes later, I walked into my meeting, looking sharp and things went very well. I’m pretty sure no one noticed the grassy scuff marks on my shoes. Every so often I get a request to do book reviews through a blog called Mother Talk. Their tag-line is “When mothers talk, great things happen.” Well, I’m not sure how I got on their email list (other than the fact that half the people who read my blog for the first time think I’m a mom) but when I saw the chance to review the book The Daring Book for Girls by Andrea J. Buchanan and Miriam Peskowitz, I figured that as a father of a young girl, I needed all the help I could get. So I signed up for the book tour. After being accepted, I was told that out of the 100+ bloggers reviewing this book, I am the only male. No pressure. 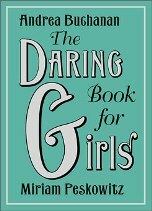 The book lacks real flow as it is filled with chapter after chapter of tips and information that showcase things that would be associated with being typically “girl” (such as how to make friendship bracelets) along with other areas that one might not typically associate with girls (such as the rules for the game of Darts). And maybe that’s the point. After all, these girls are supposed to be daring and daring girls don’t do typical girly stuff. Surprisingly (at least to me, representing the male perspective), this book is pretty fascinating to read. There are great little stories about great women in history scattered throughout the book. Many of the chapters bring you back to your childhood such as being reminded of jump rope rhymes or how to make daisy chains and ivy crowns. Each chapter brings a new experience and a fun activity and really reminds one what being a young girl is and can be. As a father trying to find ways to stay connected to his little girl, I found enough of what I was looking for to make this book a real resource. I can envision practicing Back Walk-Overs, putting her hair up with a pencil or adorning our heads with the aforementioned daisy chains and that is going to be awesome. But even better is that this book redefines what a girl is and can be. The book itself isn’t pink, it’s blue – challenging the notion that girls have to wear pink and wear pinafores. Instead, this book challenges girls to hone their science skills through creating a lemon-powered clock, playing with vinegar and baking soda and studying the periodic table of elements. It also makes clear that learning to change a tire, negotiating a salary and even whistling with two fingers is not just for boys anymore. The book is definitely targeted to school-aged girls and not for my little toddler. But that only means I’ve got a few years to practice my cartwheels before my daughter is ready to participate. I’ll bone up on how to raise a daring girl and I’ll be ready when she’s ready. And my little girl will be all the better for it. The Holiday Season is upon us, my friends. That means it is time to reflect on your good fortunes and spread peace and cheer to all buy stuff. Two days ago was “Black Friday” – the busiest shopping day of the year. Ironically, my lovely “I hate to shop” wife decided that would be a perfect day to go to TWO different malls to pick up a couple of things. I’m just starting to recover as the involuntary twitches have slowed considerably. Today (as I write this it is late Monday) was dubbed “Cyber Monday” where all of you were supposed to be hitting the AlGoreosphere to purchase your electronic back scratcher. I did not participate in this year’s Cyber Monday but I do plan on coordinating my requests for Santa through various websites. In fact, this is my ideal shopping trip. I sit on my couch, watching Sports Center while drinking hot cocoa. No parking spot required. And as I am digging deep for material in this NaBloPoMo home stretch, I thought I’d share with you a few of the dozens of catalogs that make it into my mail box in the past few weeks, along with a personal favorite. Perhaps you’ll find something good to send to your favorite blogger. Here are my Top Five shopping websites. 1) Red Envelope – This catalog has some stylish home accessories as well as nice gifts for both men and women. I have actually purchased something from this catalog so that in itself is a testament to the power of this catalog. If you’re looking for something for me, I’d suggest something like this. 2) Uncommon Goods – I just recently came across this catalog and it’s a lot of fun. Where else can you get Sock Monkey slippers for the entire family? And while I’d would love my own pair of Sock Monkey slippers, I could also see myself with one of these. 3) Autosport – I drive a 13-year-old car. The car radio no longer turns down. It’s two settings are ON or OFF. It’s advanced GPS system consists of a Thomas Guide stuffed under the passenger seat. Needless to say I day dream about one day driving a new car. One day I will need one of these for my car. And I will open up my Autosport catalog and order it with glee. 5) SkyMall – You no longer have to travel at 20,000 feet to shop from SkyMall. Most of the time, this catalog is the highlight of my flight. Now, I can browse it any time I want. And because I’m tired of my travel alarm that wakes me up every day, I can order my very own clock radio. Oh, sorry, that’s Mr. Clock Radio to you. And finally, my cousin Maggie has great taste. Her shopping blog, MightyGoods has been voted one of the top shopping blogs on the internet. She also just recently launched MightyJunior for the little ones in our lives. Prices range from a large latte to a good chunk of paycheck and it’s always fun reading her little blurbs about each item. *No one paid me anything for this endorsement. That being said, if anyone would like to pay me for any of these endorsements, I would be happy to entertain any and all offers. Tonight Swee’Pea and TheMonk sat down to their very first “sit at the table” Thanksgiving feast. We prepared a Turkey, Mashed Potatoes, Stuffing, Sweet Potato Soufflé, and, of course, gravy. As we sat down to eat, we prepared a small plate with each of the aforementioned items and served it to the waiting Swee’Pea and Monk. Each tried a little nibble but weren’t exactly wolfing down the delectable cuisine laid before them. Swee’Pea, eventually found the mashed potatoes and gravy and could not get enough. “More Mashed Potatoes, Please!” she’d ask after polishing of the glob I’d lay before her. As soon as I would lay a fresh glob, she’d jump right in. Soon, she became full of the butter & cream-injected potatoes. But she didn’t get tired of the gravy. No, she kept requesting me to put a little gravy on her plate. Not being one to deprive someone the joy of turkey-flavored fat, I indulged the little one and she happily licked the gravy off the plate with her fingers. Over and over again. Meanwhile, TheMonk was on a hunger strike. This is unusual considering he will usually eat just about anything you put in front of him – including your fingers if you’re not quick enough. Today, however, he just played with his food – pushing around the potatoes, stuffing and Turkey on his plate. “Eat your Turkey, Pumpkin.” Mommy would beseech but to no avail. Eventually, he pronounced he was “all done.” After we excused him from the table, he noticed the large, partially carved bird sitting on our counter. “I want the chicken.” he said, pointing to the large Turkey on the counter. “Okay!” we say as I jump up and tear a few pieces of Turkey off the bird. “Here’s your chicken, Buddy.” I’d say. He ate a handful of bites of the Turkey – but only when he saw me take them off the bird himself. One time, Mommy attempted to give him a bite of turkey she had in her hand. He had not seen her remove the piece from the bird so he refused it. Later, he ate the same piece as I took it from Mommy when he wasn’t looking and pretended to remove it from the bird. So, after a day of cooking and making sure everything was just right, I could have saved us the trouble by roasting a chicken and serving it with a gravy chaser. Happy Thanksgiving to all of you! May you be as blessed as we are. I have never been a handy man. It comes from growing up with a single mom. If we needed a flat head screwdriver we’d go over to the silverware drawer and pull out a butter knife. If we needed a phillips screwdriver we’d go out to the family car and pull out the little tool kit that came with the car. So, I never had a chance. After we bought our home I purchased at least three different power saws and I have used them all for a few projects around the house. I have certainly become more “handy” as home ownership has forced me to adapt. My biggest fear is that someday I won’t be able to fix it. He comes up to me holding a toy that no longer works and pleads with me, with his puppy dog eyes, to fix his beloved toy. “Fix it Daddy!” he’ll beg. Last week it was a remote control car that we bought at the dollar store. TheMonk has no skill on steering the car so the car only stops when it hits something hard. Inevitably, the car stopped working. “Fix it Daddy!” he pleads with me, holding the car in his outstretched little hands. I take the car and examine it. I determine that I will have to take it apart. I grab my small screw driver (no butter knife for me!) and go to work. I remove the bottom of the car and after fiddling around find that the motor had been slightly dislodged. I snapped it back in place, put the car back together and proudly handed over the fixed car to TheMonk who had been pacing nervously nearby while Daddy operated.